This is a beautiful French antique jewellery box. It dates to the reign of Napoleon III, circa 1860/1870. There is a beautiful inlaid feature on the lid, consisting of Kingwood, Ebony, Mother of Pearl and engraved polished Brass. The feature is surrounded by a frame of beautiful Ebony banding and inlaid Bone stringing. 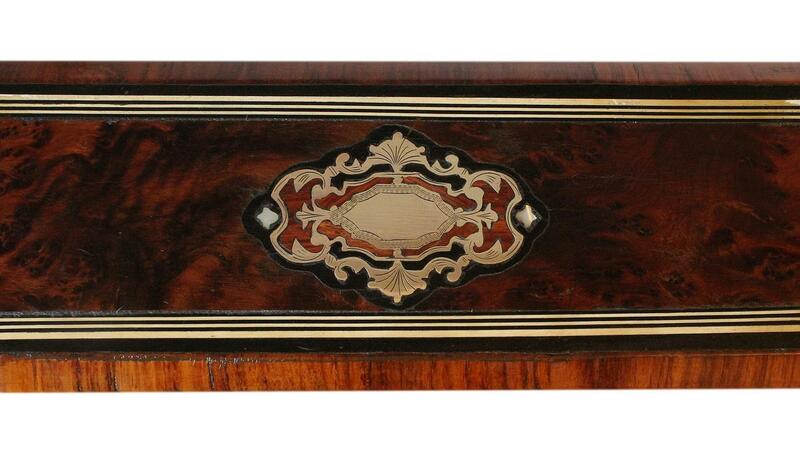 The edges of the lid are beautifully angled and veneered with Rosewood. The box is complete with its original brass stop hinges which hold the lid upright. It is also complete with its original working brass lock and period key. The lock is a quality French lock with a double locking mechanism. Please see further details about this below. The interior has a single storage compartment. This has a new padded cream satin panel in the base and new cream satin linings to the walls. The new linings are beautifully finished with blue/green satin cord trim which was salvaged from the original damaged linings of the compartment. The refurbishment has been carried out by our skilled box restorer. 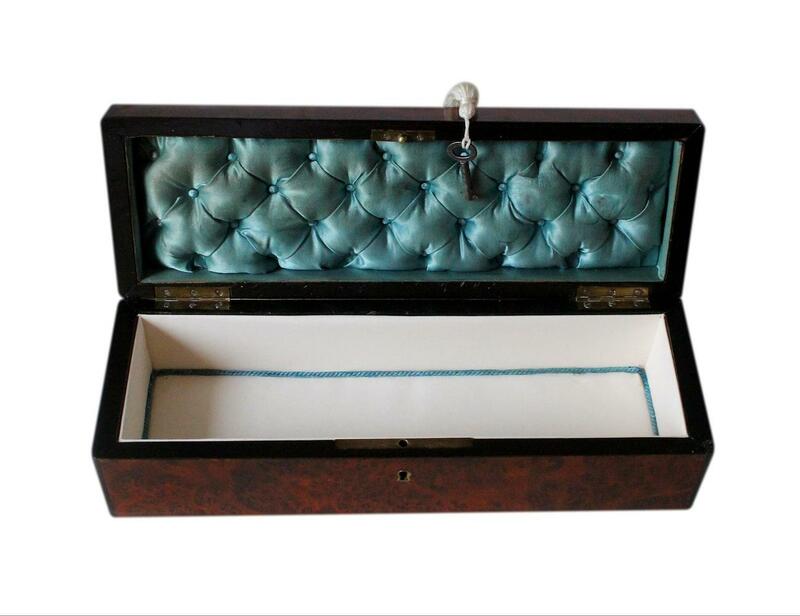 The inside of the lid has its original deeply padded silk panel and its original silk linings to the walls. The panel is beautifully quilted and has retained its original silk covered buttons. 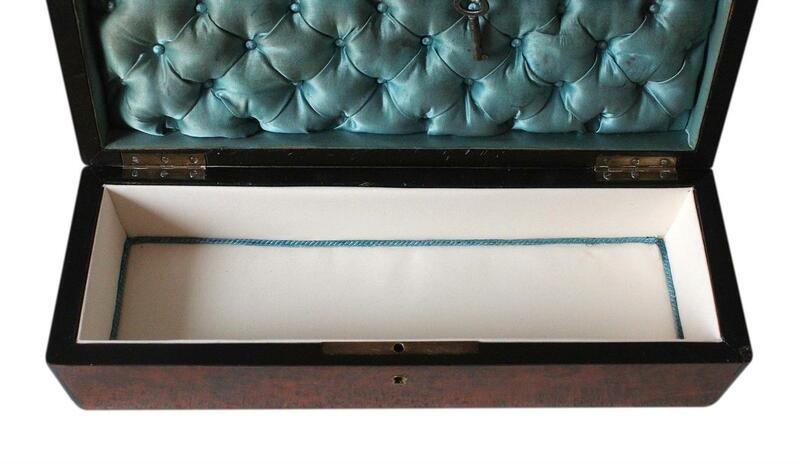 The silk is a beautiful blue/green colour, matching the colour of the cord trim in the compartment. The edges of the inside of the lid and top edges of the compartment have Ebony veneer. This box originally started life as an expensive ladies glove box. 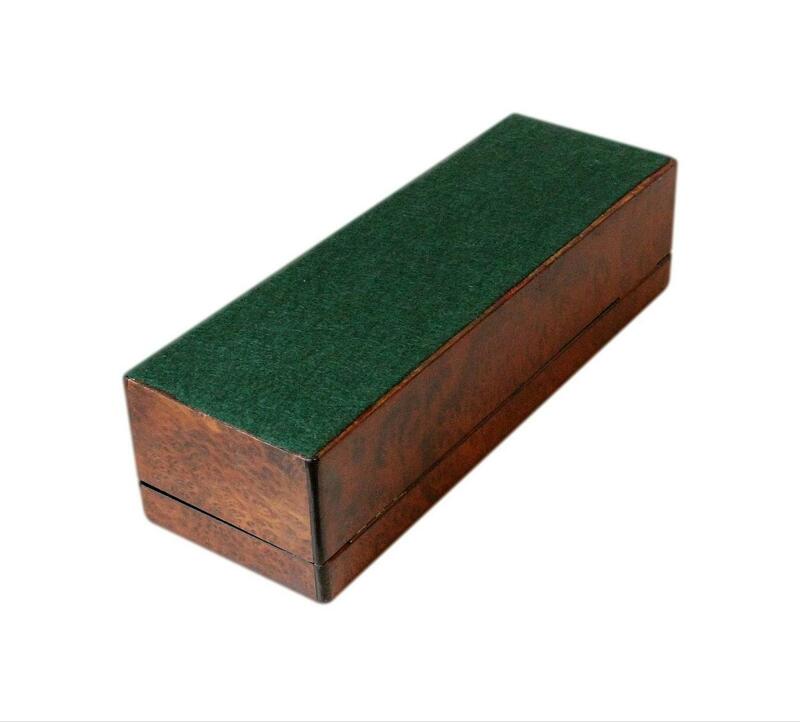 It is now more suitable as a beautiful and functional box for jewellery storage. 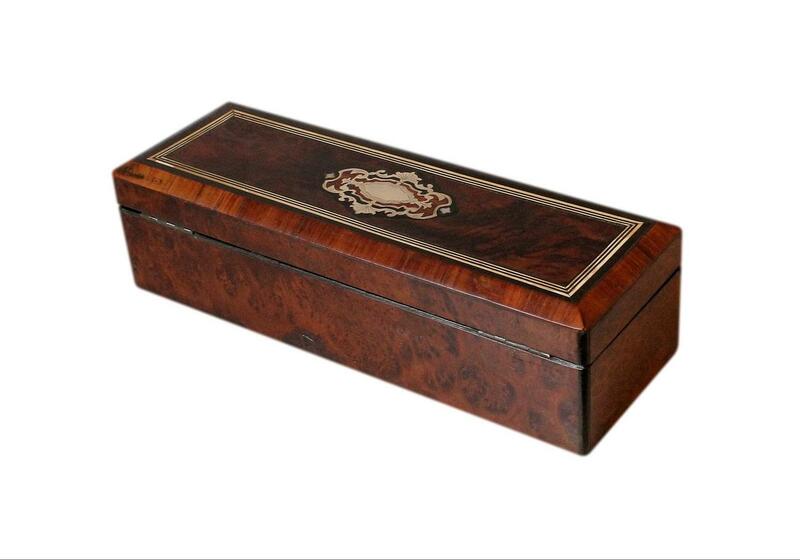 This wonderful box is in excellent condition for its 140/150 years of age. It is structurally sound and has no nasty cracks or scratches. All of the inlay, banding and stringing, is present and secure. There is a small piece of veneer missing to the front left corner of the lid and a small piece of Ebony missing to the top edge of the compartment on the front right corner. The new interior satin panel and linings are in excellent unused clean condition. There is some discolouration/staining/marks to the original silk panel/silk linings to the inside of the lid. This is as we'd expect on original linings of this age. 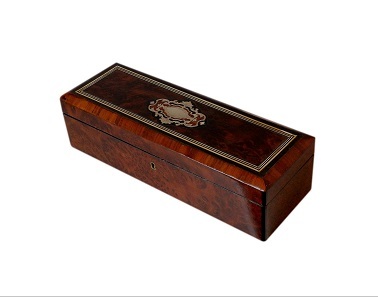 This beautiful box has a wonderful French lock which was designed to deter thieves from stealing its contents. It was cleverly designed so that its key could be turned TWICE, to both lock and unlock the box. The idea was that an intruder would believe the lock to be faulty, when it did not open upon just one turn! The lock can however be operated with just one turn if desired. Please ensure the lock is still working as soon as you receive your box. 28.8 by 7.8cm with a 5.0cm depth.